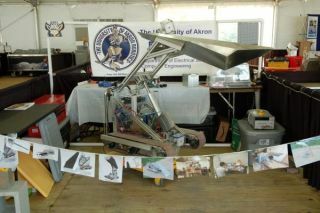 The Dust Devil team from the University of Akron and Elon University created this moon dirt digging robot for NASA's 2nd Annual Lunabotics mining contest in May 2011. CAPE CANAVERAL, Fla. — Call it the circle of robotic life. A week after NASA announced the death of the Mars rover Spirit, students from 46 teams around the globe demonstrated their ideas of a replacement robot. After a grueling five-day test of material-collecting ability, the team from Laurentian University returned home to Sudbury, Canada, with the win in NASA's second annual Lunabotics competition. The Laurentian robot collected 523.8 pounds (237.6 kilograms) of the dusty material that stood in for lunar regolith. The prize for first place was a $5,000 scholarship and invitations to see a rocket launch at NASA's Kennedy Space Center. The Lunabotics competition is hosted by NASA's Exploration Systems Mission Directorate to encourage students to pursue degrees in fields related to science, technology, engineering or math (STEM). "Last year the event was smaller and the quarters were a little bit more confined," said Blair Allen, co-host of the "NASA Edge" videocast series. "This year the venue is much better; we have more teams that are really giving it their all to win." By all appearances the Raptor team from the University of North Dakota, one of 34 American teams in the competition, was in a prime spot to win after the first day. Its robot collected 379.6 pounds (172.2 kilograms) of material. The rover looked like a miniaturized front end loader. "It's a proven, robust design that’s used every day,"said Raptor team member Joshua Rogers. "We thought, why mess with what works?" The Colorado School of Mines also looked to be an early favorite. However, a cable that moved the bucket of regolith got caught in one of the gears and snapped, stopping its efforts cold. By the final day, Laurentian University had finished first, North Dakota second and West Virginia University third. In addition to launch invitations, the second place competitors nabbed a $2,500 scholarship while third place carried a $1,000 scholarship, NASA officials said. Several other $500 scholarships were also awarded for other milestones in the contest, and teams were also awarded with school plaques and individual certificates, NASA officials said. The robots appeared to fall into two distinctly definable categories. Some were designed to have a minimum of moving parts. Others were very complex, which in some cases proved their undoing. The competing teams worked to collect the greatest amount of regolith. Each group was evaluated in five categories: on-site mining, systems engineering paper, outreach project, slide presentation and team spirit.